NASA's powerful Solar Dynamics Observatory recorded this first Mercury transit video May 9 as the planet began a 7.5-hour trip across the face of the sun. GREENBELT, Md. — The small planet Mercury is making a rare transit of the sun today (May 9), the first such event of its kind in a decade, as the world looks on. Case in point: this awesome NASA video captured just as Mercury began its journey across the sun, as seen from Earth. Safely observe this transit with high quality solar filters. Shop now! 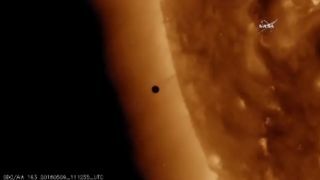 NASA's powerful Solar Dynamics Observatory recorded this first Mercury transit video as the planet began a 7.5-hour trip across the face of the sun. Another video shows the Mercury transit in a different wavelength of light. The transit, which occurs when Mercury passes directly between the sun and the Earth, began at 7:12 a.m. EDT (1112 GMT) and will be complete at 2:42 p.m. EDT (1842 GMT). You can watch the transit live online at the Slooh Community Observatory, and can also see the Mercury transit webcast on Space.com, courtesy of Slooh. When studying Mercury transits, scientists can make measurements that can help refine calculations of the Earth-sun distance, and learn more about Mercury's ultrathin atmosphere (or exosphere, as it's called), said a statement from NASA's Jet Propulsion Laboratory in Pasadena, California. "When Mercury is in front of the sun, we can study the exosphere close to the planet," NASA scientist Rosemary Killen said in the statement. "Sodium in the exosphere absorbs and re-emits a yellow-orange color from sunlight, and by measuring that absorption, we can learn about the density of gas there" on Mercury. Mercury transits can also help scientist learn how to detect alien planets around distant stars. When a planet like Mercury crosses the face of its parent star, the total amount of light from the star seen by a telescope dips a bit. By searching for this telltale dimming effect around distant stars, astronomers have managed to find more than 1,000 confirmed alien planets. NASA's Kepler Space Telescope, in particular, has used this so-called transit method with great success. "Additionally, scientists have begun exploring the exospheres of exoplanets," NASA officials at JPL wrote in the statement. "By observing the spectra of the light that passes through an exosphere — similar to how we study Mercury’s exosphere — scientists are beginning to understand the evolution of exoplanet atmospheres as well as the influence of stellar wind and magnetic fields." Editor's note: Visit Space.com today to see live webcast views of the rare Mercury transit from Earth and space, and for complete coverage of the celestial event. If you SAFELY capture a photo of the transit of Mercury and would like to share it with Space.com and our news partners for a story or gallery, you can send images and comments in to managing editor Tariq Malik at spacephotos@space.com.